View of “We Like It Up Here, It’s Windy, Really Nice,” 2013. Built specifically for the ISCP gallery space, Brian Duggan’s latest installation, “We Like It Up Here, It’s Windy, Really Nice,” recreates the roof of an Indonesian train carriage. The whimsy of the installation’s title takes on an ironic clang in light of what it actually represents: concrete balls hung over railway lines by the country’s government to discourage individuals from riding atop train roofs. 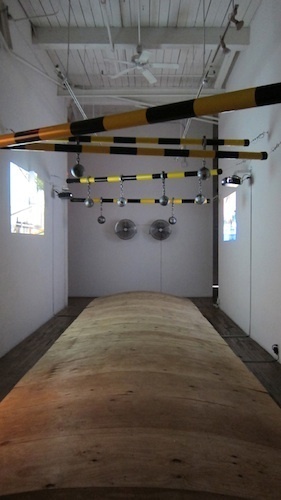 In Duggan’s work, metal-colored balls attached to heavy chains dangle ominously above a gangway of bowed plywood. Animated by fans, the balls’ kineticism—along with the noise of an attendant soundtrack and attendant video of passing trains—evokes something of the circumstances inspiring the piece. No mere joyride, such means of travel form a free commute for many poor Indonesians who cannot afford the fare. One of the most grounded, incisive artists working in Ireland today, Duggan has long concerned himself with questions of labor and leisure: their insidious rapport, their respective traces in the social landscape. One of his most striking works is a small-scale steel model replica of the idle Ferris wheel in Pripyat, Ukraine, a nuclear city in the former Soviet Union that was built for workers at the Chernobyl Nuclear Power Plant, complete with a fairground for weekend entertainment near the ill-fated reactor. Static and patinated, Duggan’s model of the wheel’s inactivity evokes the site’s abandonment after the 1986 nuclear disaster and all the leisure unlived in its spaces. In a similar fashion, “We Llike It Up Here” plunges the viewer into a realm where the seemingly casual navigation of space bespeaks a more chilling history. Mixing sounds from Jakarta with snippets from New York’s subways, the piece thrusts fragments of more far-flung realities—aural and material—into our contemporary comfort zone and asks us to plot our own metaphorical course.